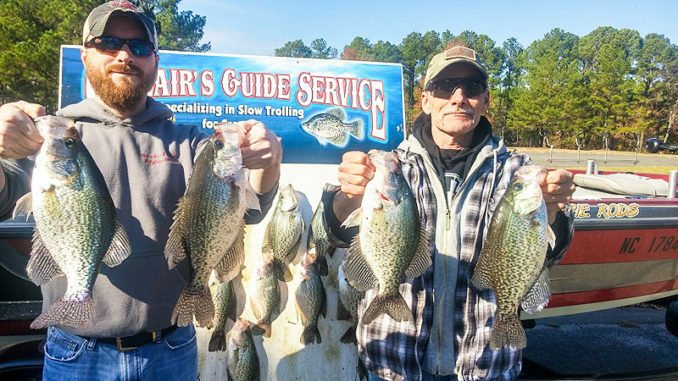 Cold weather doesn’t slow down the crappie bite at North Carolna’s Jordan Lake; it just moves it to deeper water. 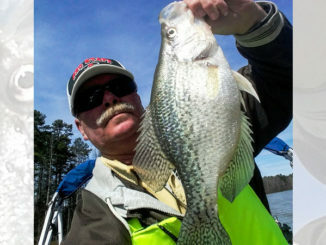 When water temperatures reach their lowest levels in January, crappie also reach their deepest depths at Jordan Lake. Freddie Sinclair of Clayton, NC isn’t bothered by that. He deepens his tight-lining spread and drags the deep channels. And he fills his boat with slabs that are hunkering down to feed on shad. The majority of the channels and ledges Sinclair targets are in 30 to 35 feet of water, with schools of crappie ranging from near the bottom to 20 feet below the surface. This makes the main-river channel that winds through the lake and the ledges that drop into it a focal point for a lot of good crappie fishing. Sinclair said that main-lake points where the slope continues into the river channel are hot spots. The S-turns on the lake’s Haw River side, and the US 64 bridge also get plenty of attention. Below the sinker, Sinclair ties either a 1/32- to 1/16-ounce jighead or a gold, No. 4 crappie hook. He tips both with a minnow. Jig colors include black, pink, red, orange, and chartreuse. He favors the brighter colors in stained water. Sinclair said a trolling speed between 0.2 and 0.5 miles per hour is of particular importance. He also staggers bait presentations to be above the crappie marked, but as close as possible. That’s because the colder water will not allow them to give much of a chase. 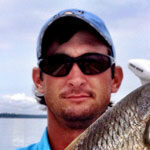 –Shearon Harris Lake is another great spot for cold weather crappie. Click here to read all about it.